Osteoporosis is the most common bone disease in humans. During bone remodeling, specialized blood vessels influenced by the endothelial cells (CD31hiEmcnhi, also called type H cells) are formatted to supply nutrients. Reductions in vascular supply are associated with bone loss resulting in osteoporosis. 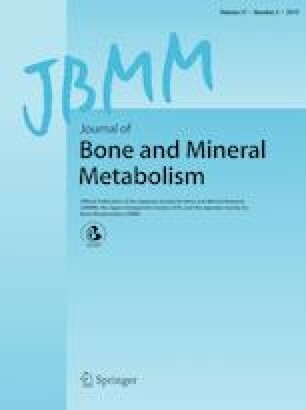 Therefore, the objective of the present study was to explore the association between the CD31hiEmcnhi endothelial cells and bone mineral density (BMD). In this prospective study, 134 Chinese women were enrolled and examined. BMD was measured by DEXA method while the percentage of CD31hiEmcnhi endothelial cells in the intertrochanteric part was measured by flow cytometry. The percentage of CD31hiEmcnhi endothelial cells in postmenopausal subjects was significantly lower compared with premenopausal women (8.7 ± 4.0% vs 13.2 ± 5.6%, P < 0.01). Meanwhile, the CD31hiEmcnhi endothelial cell levels in osteopenia and osteoporosis were significantly lower compared with subjects with normal BMD (9.84 ± 4.2% in osteopenia and 7.11 ± 3.2% in osteoporosis vs 12.7 ± 5.6% in subjects with normal T score, P < 0.01). Multiple regression analyses showed that the CD31hiEmcnhi endothelial cells level was positively associated with femur neck and total hip BMD, but not with lumbar BMD. Our study suggests a significantly positive association between CD31hiEmcnhi endothelial cells and local BMD in Chinese women. The proportion of CD31hiEmcnhi endothelial cells is a marker of bone quality and represents a potential target for treatment of bone loss. Yong Zhu and Zhe Ruan have contributed equally to this work. This work was supported by Hunan Provincial Natural Science Foundation (2016JJ6165). All procedures performed in this study involving human participants were in accordance with the ethical standards of the Institutional Research and Ethical Committee of Xiangya Hospital and with the 1964 Helsinki Declaration and its later amendments. All the participants signed a written informed consent and the work was approved by the Ethics and Research Committee of the Xiangya Hospital.